The ride is scheduled for December 4, 2010. It might rain that day, but that's what happens sometimes in the winter. We start at 5:00 A.M. sharp. Please plan to arrive between 4:00 and 4:30 and be ready to go at 4:50 A.M. The Double starts and ends at Ken Holloway's house at 3965 Olga Drive, San Jose, CA. Google maps seems to provide an accurate map to the start location (or see directions below). Don't park in Ken's driveway or that of his neighbors. It's actually best to park a couple hundred yards away on Hibiscus just north of Olga at a school. There is quite limited space on the street, so pretty much everyone will need to park at the school. Call Ken at (408) 554-0180 if you get lost. From the NORTH, take the exit and go RIGHT on Saratoga Ave.
From the SOUTH, take the leftmost of the two exit lanes. This will take you under Saratoga Ave and back around. Make a RIGHT on Saratoga Ave.
Make a LEFT on WILLIAMS - there is a Stoplight and a Wendy's on the near left corner. This is about 2/3 mile after exiting 280. Go LEFT ON HIBISCUS (the 5th left turn). Go LEFT on OLGA DRIVE (the first left after a long block). It is the 2nd house on the right - 3965 Olga Drive. It is a green house. Please try to be quiet and not disturb his neighbors. Once you've got your bike ready you are welcome to come into the house and use the bathroom - you can park your bikes against the house, or on the lawn. Take the Pacheco Pass (Hwy 152) exit from 101. This is the second Hwy 152 exit you will see in Gilroy. Turn right and this will become 10th street. This will cross Monterey and after about a mile will dead end into Uvas Park. Turn right on Uvas Park (the only direction you can go) and after about 1/4 mile you will come to 8th St./Miller (the road changes name around this point). Turn left on Miller. It will be less than 0.2 miles to the park entrance which will be on the left. There is plenty of parking, picnic tables, and relatively clean bathrooms. For insurance reasons, we can't require payment for the ride as it's presently run. This doesn't mean that the event doesn't cost money to put on. We'd be more than happy to have people make a small donation to help defray the cost of the event. Based on previous year's costs, a $10 donation is suggested. The food is purchased based on the number of people who RSVP in the week prior to the ride. If you RSVP that you are coming, I'll be buying food for you and will expect to see you there. The route is largely the same as the past few years. We will be returning to the route over Kennedy Rd in the morning. I have attached a copy of the route to the bottom of this. The double will have a mass start. For the first 3 or 4 miles, please stay together and don't run into anyone in the dark. We will make several turns so if you aren't sure where to go, stay at the back and follow those who know the route. Once we get on Quito, everyone is on their own and can go whatever speed they want. i.e. feel free to drop the leaders. The first 10 miles of the route out in the morning is the reverse of the route home in the afternoon. The route heads over Kennedy Rd. to the Almaden area, and out past the reservoirs to Gilroy. We bypass downtown Gilroy. The first (and third) rest stop is at a park on the south side of Gilroy. It's the location of the Gilroy Garlic Festival. It's the start/finish of the century and is the first and third rest stop for the double century riders. 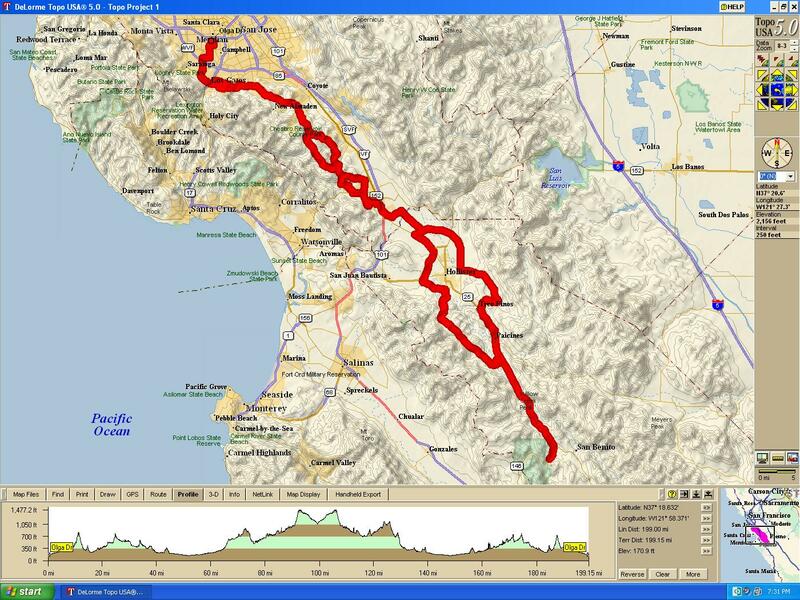 After leaving Gilroy, we will bypass most of Hollister by using a route that goes east of town. This will avoid both Hwy 25 and 156. The route along Santa Ana Valley Rd and Qien Sabe has some gentle climbs and a final descent that gets us back onto Hwy 25 at Paicines. We take Hwy 25 to Hwy 146 where we go 2 miles to the Pinnacles campground store. This is the turnaround point. The route back to Gilroy uses Old Airline and Cienega Roads for part of the way. After returning to Gilroy, the double riders continue using a slightly different route through the reservoirs. The "century" is about 111 miles but the double measures just about 200 miles - depending on who's bike computer you want to believe. Century riders should not need lights. Double riders will need lights. The first 30 miles of the ride will be in the dark, and you'll likely need them again in the evening. Make sure you have tail lights. Everyone involved is an adult and can choose what level of lighting they are comfortable with, but I consider a single 2-3 watt light to be quite inadequate for use in the urban areas around the start and finish. If you plan to use something like a Cateye Micro, I think you should attach two to your bike for use in the more urban areas so that oncoming traffic can see you. The same is true for people using something like a Schmidt generator hub (these are about 3 watts), maybe more so as they will lose most, if not all of their forward lighting when they stop. They will need some sort of battery powered light anyway in case they have to fix a flat tire or have some sort of mechanical issue. Reflective clothing, leg bands, etc., is also strongly recommended. 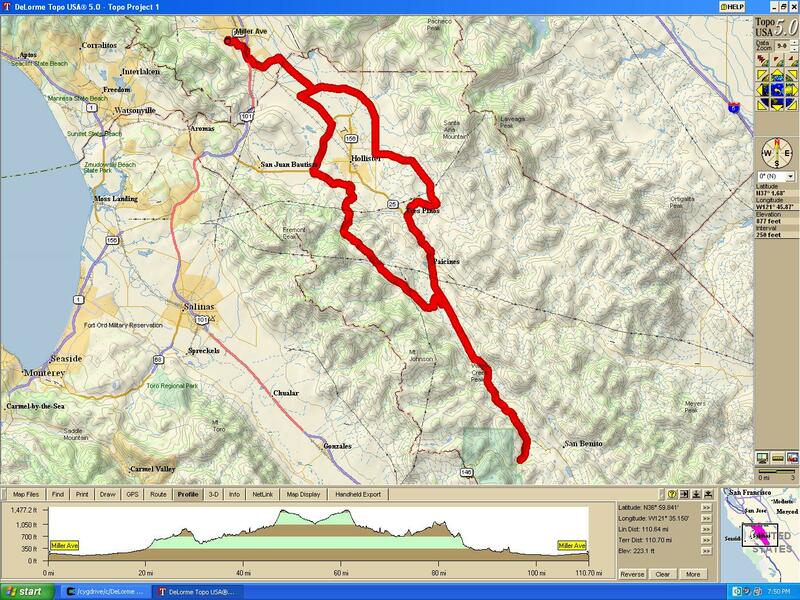 The WSDC is being run by Almaden Cycle Touring Club (ACTC) as it was the last couple years. The support will be limited compared to double centuries like Davis, but there will be three rest stops with food and water along with some amount of SAG support. The three rest stops are about 50 miles apart. There are some very long stretches without stores or gas stations. Because of the time of year, water is not as big a problem as it would be in July, but many people will find bringing a Camelback to be useful. The Ride - Am I Ready? How Long Will it Take? etc. The century is pretty simple. No big hills, nothing steep. Assuming an 8:00 A.M. start, you have 8 hours to ride the 111 miles and be done by our recommended 4:00 P.M. finishing time. The only issue is that there has often been a fairly strong headwind on the way north back to Gilroy. The Cienega Road loop shields the route from some of the winds, but at the price of a bit more climbing. The double is a bit more challenging for several reasons. Riding in the dark is slower. There are a few short but steep stretches. There is more urban riding at the beginning and end. While there won't be much traffic in the morning, there can be traffic in the evening. We normally have had headwinds on the second half of the ride. This is not the easiest double around; it isn't by any means the hardest either. There is no obligation to wait or regroup. If you want to ride with someone, and you can keep up with them, that is okay, but they don't have to wait for you, nor you for them. We tend to get pretty spread out with the first finishers as much as 3 hours ahead of the last finishers. This is also not intended to be done as a "race". We don't keep results. If you finish the double prior to 5:00 P.M., you may not be able to get in the house. We've found in the past that people take about two hours longer to do the Winter Solstice Double than they take to do the Davis Double. Why - there's a bit more urban riding, there are fewer people to draft, there is often a headwind home, there is at least a couple hours of riding in the dark, and most people aren't exactly in mid-season shape right now. It's kind of bad form to be in good shape this time of year anyway. In the past we have postponed the ride for major storms, but garden variety bad weather does not cancel the ride. Usually it is clear and sunny for the WSDC. Riders should come prepared to deal with rain and cold however. If you are lucky there may be a SAG but maybe not. You need to be ready to ride 200 miles while wet and/or cold, or be prepared to call a friend to get a ride. You need to have your bike in good mechanical order. The only rest stop that will have much SAG capacity is on the way back at Gilroy. This is the finish point for the century riders and they may be able to help carry DNFing double riders back to San Jose. Route Sheets, Check in, etc. We will have full route sheets for the entire ride. Please take one and stay on the route. If you get off the route, we will have trouble finding you, provided there is SAG. There will be no markings on the road. For double riders, we'd like to make sure that our volunteers can get back to the finish in time to join in the potluck. Recommended times to LEAVE each rest stop (you'll have to get there earlier if you want to sit around) are 8:30 A.M. for Gilroy outbound, 12:30 P.M. for the Pinnacles, 4:30 P.M. for Gilroy inbound, with a goal of having everyone finished by 8:00 P.M. You don't have to ride very fast to do this, but you need to keep moving. Much of the difference in "speed" between the faster and slower riders is really the time spent stopped along the way. We have a potluck dinner at Ken's place after the ride. We normally provide beverages but feel free to bring something to share. We will have pasta also. The double riders should bring their dishes with them at the start and we'll find some refrigerator space for everything. We'll also provide showers to the double riders. But please bring a towel. Please re-confirm your attendance, preferably by e-mail, by December 2 to Dave Hoag. 47.51	S	Becomes Bolsa Rd. 114.09	L	Old Airline Rd.